These deluxe African Brocades also known as Bazin is made with 100% finest cotton It comes in solid colors and beautiful designs in the background. 40 stars. Show your taste with this top quality Brocade from Tenuci that never fades. Brocades are popular for making Dashiki, Agbada, Boubou, Caftan & More. 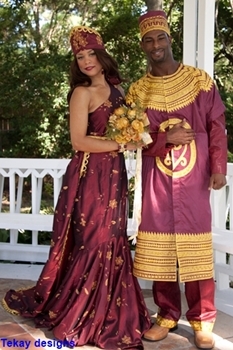 You will sure look like a Royal African prince or princess in the final outfit. The price is per 5yds.